From the geneses, integration in the Central African Economic and Monetary Community, CEMAC, has remained in the jaws of procrastination. Lack of political will by some of the leaders and other factors stood on the way of this lofty idea. Thus, only divine intervention will ensure that the resolutions of the CEMAC extraordinary summit that held in N’djamena, Chad on October 31, are implemented. Free movement of goods and persons remains the issue at stake. It is one that the countries of the Sub Region have procrastinated on for too long. Before the N’djamena summit which President Idriss Deby chaired, something unusual happened. Gabon and Equatorial Guinea, considered as obstacles to integration, signed press releases, sanctioning the free movement of CEMAC citizens and goods in and out of their countries. The two countries had stood on the way of such an integrating idea for many years, raising security issues and the fact that they have smaller populations as compared to other countries. Such resistance stalled integration in the Sub Region, keeping intra-communal trade among CEMAC countries in the doldrums of barely 3 percent. The sudden U-turn on the free movement of persons and goods by two countries did not come by happenstance. It was no political will by the two countries that delighted in chasing away nationals of other CEMAC member countries, especially Cameroon. Their arrogance has now been cut to size by dwindling fortunes imposed by the drastic fall in oil prices in the world markets. We got it on good authority that the International Monetary Fund, IMF, told them to either hearken to the free movement of goods and persons or perish. For one thing, CEMAC countries are bound to play ball because they are all under the IMF-monitored Structural Adjustment Programmes, SAP. 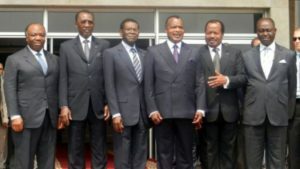 They all bowed to IMF during the CEMAC extraordinary summit in Yaounde on December 23, 2016, when President Paul Biya and his peers raised an alarm on the sub-region’s declining economic situation. The CEMAC economies that relied mostly on petrol revenue are in bad shape, very bad shape. Integration meant nothing to them, even though; they would in all pretence, sign resolutions at summits to ensure free movement of goods and persons. Such an attitude ensured that the Sub Region that has 38million inhabitants remains in the Stone Age of economic development. Moreover, the rivalry among CEMAC Heads of State did not help matters. Some of the countries decided to go solo in making moves that would have been the collective concern of the economic bloc. For instance, Cameroon is in the bad books of other member countries for having signed and validated the Economic Partnership Agreements, EPAS, with the European Union, EU, despite the fact that CEMAC had begun negotiations as a bloc. The disagreement between leaders led to the creation of two Stock Exchange markets in Libreville, Gabon and Douala in Cameroon, whereas the Sub Region needs only one. Apart from Cameroon, Chad, Congo, other countries are yet to adopt the CEMAC passport. The creation of a common airline company for CEMAC countries has remained only on paper. This explains why the CEMAC Chair, Idriss Deby Itno, drew heavy applause from his audience when he said geographical and national barriers had long disappeared from the minds of CEMAC citizens. To him, it was the leaders, holding back the free movement of goods and persons. He said it is imperative for the people of CEMAC countries to be living together and doing business together. It was a tacit scold on countries that are yet to ensure the free circulation of goods and persons. From every indication, it is now incumbent on every CEMAC member state to apply the CEMAC decision No01/13 of June 25, 2013, that provides that all countries put down barriers for real integration. One thing that haunted the CEMAC Commission was the non-payment of the community integration tax by member states. Unpaid arrears of the tax that was instituted in 2000, stands at FCFA 250 billion. Given the economic recession in the Sub Region, it was agreed that the tax will be cut by 90 percent for member countries to be able to pay. Cameroon designated former Secretary of State, Shey Jones Yembe, to take over from Paul Tasong as member of the CEMAC Commission. Former Gabonese Prime Minister, Daniel Ona Ondo, replaces the Congolese Pierre Moussa, as Chair of the CEMAC Commission. Observers are expressing the wish to see CEMAC implement integration to ease the free movement of goods and persons like the case in the ECOWAS bloc in the West African Sub Region.